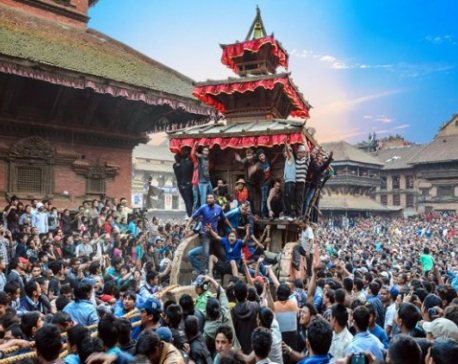 BHAKTAPUR, April 15: Welcoming the spring season of the year, natives from Thimi celebrated annual Sindoor Jatra (festival of vermilion) on the third day of 10-day-long Bisket Jatra here on Bhaktapur. 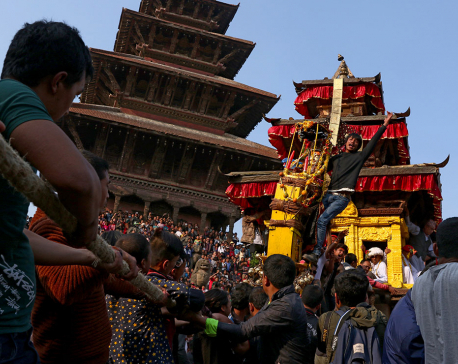 People march along the alleys and streets of Thimi, Bhaktapur with the beats of traditional drum Dhime while carrying palanquins locally termed as khats. As the 32 khats come together, sindoor (vermillion powder) is hurled at them and the ceremony reaches fever pitch as the khat bearing Ganesh arrives from the village of Nagadish. Crowds parade up and down the streets until late morning when Ganesh, borne by hundreds of men, makes a break for home, pursued by other khats. If the latter can catch Ganesha, the activities are prolonged, but eventually, Ganesha departs and the festival moves on to Taleju Temple. Later, in the day, crowds swarm to Bode to witness the tongue-boring festival. The participants throw vermillion powder to each other and play various traditional music and dance. They carry chariot of various deities around town while playing colors during the festival.